Building on an earlier overview brief, this sNAPshot takes a closer look at how the Philippines initiated sectoral integration of adaptation considerations, and how this compares with approaches that other countries are taking. The Philippines falls at the nationally driven end of the spectrum. The country developed a National Climate Change Action Plan that outlines a long-term program and strategies for adaptation and mitigation in line with its national development plan. The Philippines Climate Change Commission (CCC) coordinates involvement with stakeholders from relevant national agencies and ministries, local government units, academia, business and civil society. View this figure online here. The Philippines is a lower-middle-income country that is especially vulnerable to the impacts of natural disasters. The country’s economy is dominated by the services sector, which contributes over half of the nation’s economic output, followed by industry making up 31 per cent and agriculture accounting for 10 per cent. The Philippines is particularly susceptible to typhoons and tropical cyclones. Flooding and landslides also pose significant risks to the country. In 2010, the Government of the Philippines released its National Framework Strategy on Climate Change (NFSCC), which envisions a “climate risk-resilient Philippines with healthy, safe, prosperous and selfreliant communities, and thriving and productive ecosystems.” The framework stresses a balance between adaptation and mitigation, and laid the groundwork for the development of the National Climate Change Action Plan (NCCAP) for 2011– 2028 (Ministry of the Environment [MOE], 2015). The NCCAP is the starting point for guiding integration of climate change priorities across sectors. 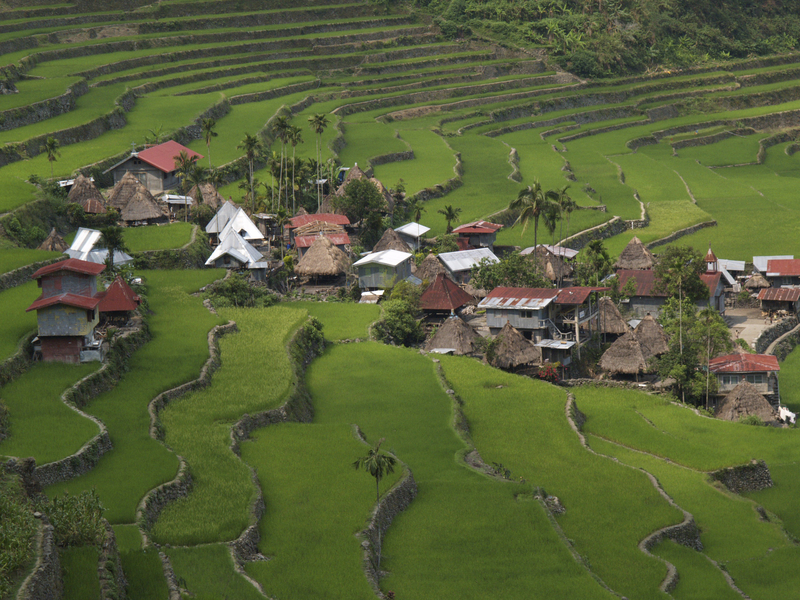 The NCCAP provides guidance for both adaptation and mitigation and calls for due attention to the concerns of vulnerable sectors, prioritizing food security, water sufficiency, ecosystem and environmental stability, human security, climatesmart industries and services, sustainable energy, and capacity development. The NCCAP is sub-divided into three phases of six years each, in alignment with the Philippine Development Plan (PDP) and the National Disaster Risk Reduction and Management Plan (Government of the Philippines, 2011a; MoE, 2015). The PDP for 2011–2016 is the country’s development framework that seeks to address poverty, create employment opportunities and achieve inclusive growth. Climate change is an important cross-cutting topic within the PDP, recognizing the vulnerability of the Philippines to climate-related hazards. (Government of the Philippines, 2011b). The Climate Change Commission (CCC), an agency attached to the Office of the President, was established pursuant to the Climate Change Act of 2009. The CCC is mandated to lead the coordination, monitoring and evaluation of climate change-related plans and programs in the Philippines with support from an Advisory Board and National Panel of Technical Experts. To ensure effective coordination of climate change priorities across sectors and with overall development planning, the CCC works in close collaboration with the National Economic and Development Authority (NEDA) on the implementation of the PDP. It also works closely with the National Disaster Risk Reduction and Management Council on the formulation and implementation of a framework for climate change adaptation and disaster risk reduction and management (see Figure 2; MOE, 2015). Moreover, the Cabinet Cluster on Climate Change Adaptation and Mitigation provides a venue for high-level policy discussions on climate change: the CCC serves as the Secretariat for the Cabinet Cluster (MoE, 2015). The central role of the CCC in leading the climate change initiatives across government in the Philippines makes it an example of a nationally driven approach to initiating sector integration. The CCC also works closely with Local Government Units (LGUs), which are seen as the “frontline agencies” in integration and implementation of climate change-related activities in their respective localities (Government of the Philippines, 2011a). The Philippines People’s Survival Fund, managed by a board that includes representatives from the Department of Finance, the CCC and NEDA, supports climate change adaptation programs and projects in LGUs. The national fund can be used to finance a wide range of programs and projects addressing climate change impacts across different sectors such as agriculture, environment, health, infrastructure, and institutions—making it an important mechanism for facilitating cross-sector integration at local levels. The Philippines Development Forum is the mechanism used to facilitate substantive policy dialogue among stakeholders on the country’s development agenda, including international development partners providing support in the country. Through the forum, these stakeholders are involved in dialogue through 10 thematic working groups, including climate change. As the national economic and planning agency, NEDA manages the public investment program, which translates the country’s development plan and donors’ statements of commitment into core priority programs and projects that the government will implement. The NEDA board reviews large projects and programs worth more than USD 12 million, while smaller amounts of funding may go directly to a relevant agency (Organisation for Economic Co-operation and Development, 2014). The Philippines is an example of a country with donor coordination mechanisms in place with potential to help to ensure coordination of support for adaptation across various sectors and levels.